Timecode is a track that allows for synchronization and editing within a video or an audio file. 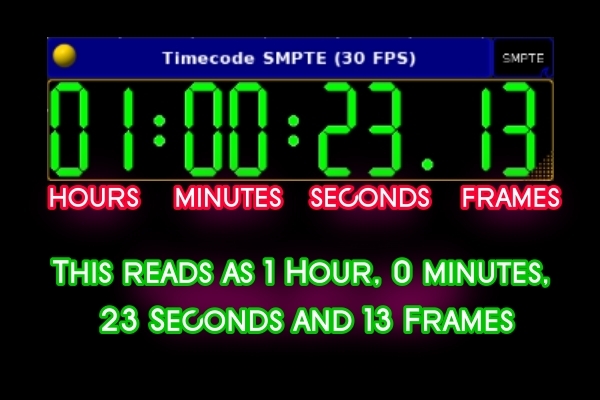 SMPTE timecode is a standard that was created by the Society of Motion Picture and Television Engineers (SMPTE). 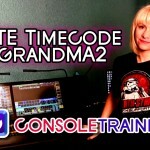 While there are wide variations in possible uses, I’m going to restrict this article to the topic of how we, as programmers, can use SMPTE timecode to synch up our lighting cues with music. I’ll have links at the end if you’d like to learn more about the protocol. On some tours, the band may play to a “click track.” This is a piece of audio that helps to keep the musicians and dancers in time. On other tours, a ProTools operator may be generating some of the music or effects that you hear alongside (or in place of) a band. In either instance, a common practice is to associate a piece of timecode with the tracks that the ProTools operator is using. 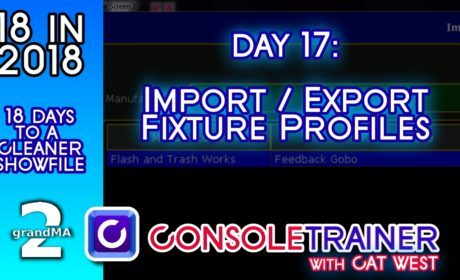 That timecode file can then be sent to the lighting console and used to trigger cues at particular moments. Another scenario (though not as common in a touring scenario) would be that timecode is embedded in a video file. You might find that setup in a corporate event. Timecode will be delivered to your console over an XLR cable. Yes, it is possible to send timecode over Midi, but again- using concert touring as our example- XLR LTC SMPTE is the norm. 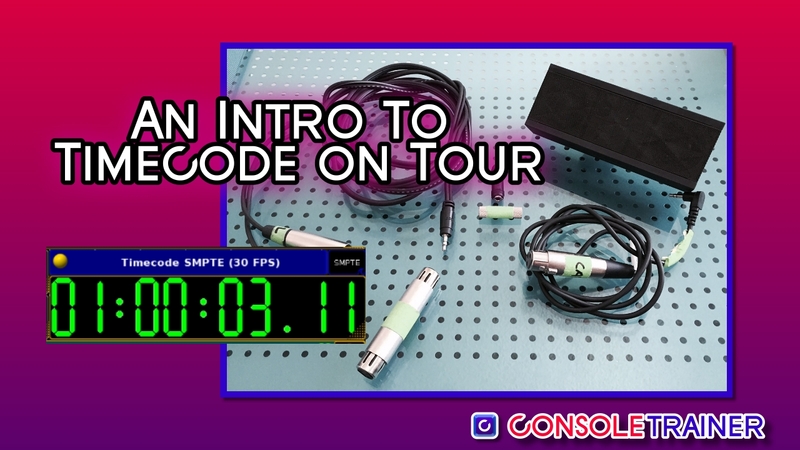 Regardless of what cable is used to transmit the signal, the end result would be that your console would be able to read SMPTE timecode in real time. Hours, minutes, seconds, frames per seconds… This should look a lot like the counters we used to see on old CD and VHS machines. The frame rate is dependent upon personal preference of whomever is creating the timecode. You could see 30, 29.97, 24 or 25. All are valid formats. ProTip- If you’ll also be frame-synching your media server playback with timecode, then the frame rate of the content MUST match the frame rate of the timecode. 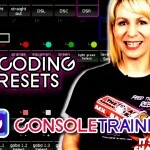 Every console will have some way of reading the raw timecode natively, but they each have their own menu systems that you’ll need to configure to match the timecode that you’re receiving, and to what your needs are regarding playback. I’ll have more information on that in the tutorials for MA2 and Hog timecode setup. Once your incoming timecode is configured, it will be a matter of telling the console what cues or actions should be taken at different points in the timecode. At this point, you should already have most of your cues built (or even just roughed in). 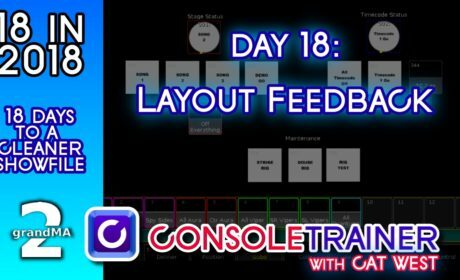 You can absolutely still alter your cues after your setup timecode triggers. You can also add/delete/edit timecode triggers until your fingers fall off. BUT the key here is to have some sort of events for the timecode to actually trigger. Respect the ProTools Op- they usually have a lot of other duties, and have to be available for band rehearsals, music changes, etc. That means, they don’t have time to sit around playing back the audio for you so that you can figure out when your cues need to be triggered. You need to be able to do this yourself. Get copies of the music (MP3, wav, whatever) that you can play back on your personal computer. 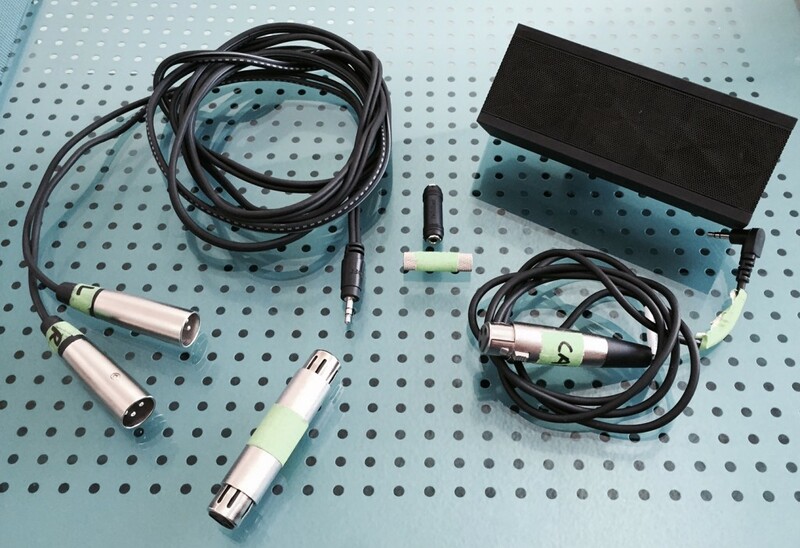 You’ll need a stereo splitter that connects from your computer’s output (probably 1/8th inch) that splits into 2 male XLR outputs – left and right. Whichever side of the audio has the timecode will get plugged into your console. The other side – the one with the music- can be plugged into a speaker. Don’t have an XLR speaker? No problem, just use the appropriate adaptor for your speaker. Once you’re setup at FOH, you can play, pause, or rewind the track at your leisure. Timecode needs to be nice and loud (and clean). Pump up the volume. If your volume is to low, timecode won’t be read. You can now set up your timecode triggers, and test them with the music. Just don’t forget to switch to the ProTools Timecode feed before band rehearsals start! Pro Tip- A popular way (and one I really like) for the crew generating the timecode to keep things organized is to have each song’s timecode file start at a different hour. Maybe song 1 starts at 1 hour, song 2 at 2 hours, etc. If every song starts at the same timecode mark, it’s impossible to be sure which timecode file you’re receiving. 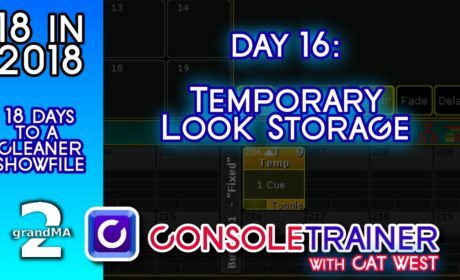 It’s not IMPOSSIBLE to run your show this way, but it takes some organization and a few more steps, and can be a headache in the setup phase. Pro Tip 2 – I always ask for the timecode tracks to have a couple seconds of lead time. This means, they are sending me a second or two of timecode before the music actually starts. This allows the console to lock on to the feed, and also I can see it working before my triggers run. Obviously, this lead time is at the discretion of the audio crew… sometimes you’ll get it, sometimes you won’t. BUT, you should always ask. If you are worried that your console is not reading the timecode, and you want to test the timecode feed – there are many external timecode readers and generators available on the market. These pieces of hardware can be incredibly useful in many scenarios, but the good ones ain’t cheap. However, there are timecode reader applications that you can install on your computer. SMPTE reader for Mac is not a fancy program, but it will read timecode running into your computer- and it’s FREE.